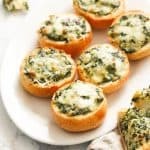 Spinach Dip – creamy homemade spinach dip with sour cream, cream cheese, spinach, variety of cheeses and a dash of red pepper flakes for a little kick in every bite. Served in bread rolls or in a bowl with crackers and crudites. An absolutely great addition to any party menu! Slice top portion of bread roll and remove the inside of the bread; set aside. Place a small sauce pan over medium high heat, add oil followed by onions and garlic; saute until soft about- about 2-3 minutes. Set aside. In a large bowl, add cream cheese, sour cream and mayonnaise. Thoroughly combine. Stir in your spinach, then the onion mixture. Then add mozzarella and parmesan cheese, mix. Season with Worcestershire sauce, Creole seasoning, pepper flakes, salt and pepper. Continue mixing until well combined. Spoon spinach dip into your prepared rolls and top with remaining mozzarella cheese. Bake on a baking tray at 350 degrees F for 12-15 minutes or until cheese is melted and bread is heated through.